On December 10, 1864, 150 years ago today, Gouverneur Warren was in a tight spot. He was 40+ miles south of Grant’s headquarters at City Point, with Hampton’s Confederate cavalry on his front and A. P. Hill’s column of Confederate infantry lurking dangerously close to his right flank. If Hill could beat Warren to Jarratt’s Station on the Weldon Railroad, he might also beat him to Sussex Court House, blocking his escape route across the Nottoway River. Warren started around 7 a. m. on the morning of the 10th, a somewhat surprising late start given the circumstances. He put one cavalry brigade in the lead as he headed norh up the now destroyed Weldon Railroad. His infantry followed, Griffin first, then the supply train, and then Mott, Ayres, and Crawford. The remaining two brigades of Gregg’s cavalry division brought up the rear. This was not going to be an easy march for either side. Sleet had fallen all night as the temperatures plunged. Blue and Gray alike woke up to an ice covered landscape and a tough road to travel. After moving north a few miles, Warren split his forces into two columns, most of the cavalry moving north to Jarratt’s Station, and then east to Sussex Court House, and the infantry taking a more direct route northeast to the Sussex County seat. 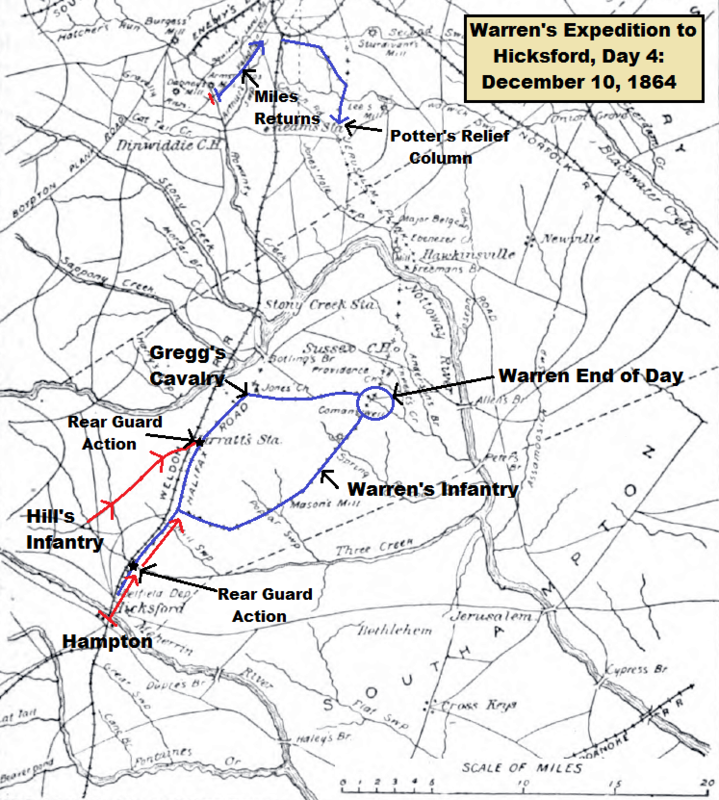 Hampton and Hill followed their agreed-upon plan from the night before, with Hill moving northeast to Jarratt’s Station and Hampton harrying the retreating bluecoats from the south. Neither was fast enough, despite Warren’s late start. Rear guard actions occurred all day long, with two of the biggest occurring at Three Creek and Jarratt’s Station. The Federals prepared multiple local ambushes to further retard the Confederate pursuit. Slaves swarmed to the retreating Federal columns, and some told the Union soldiers about their comrades who had been murdered along the route by guerrillas. Once the Union soldiers found this to be true, they began burning every building along the retreat route. The applejack they had pilfered from Southern homes wouldn’t have helped to calm their mood either. The pursuing Confederates were appalled at the destruction applied to personal property in the middle of a bitterly cold winter day. Ultimately, Warren’s two wings reunited a few miles south of Sussex Court House and bedded down for the night. Hill and Hampton were still on their heels. While the raid was reaching its apex and receding, Robert E. Lee performed a reconnaissance of his own on the north side of the James River. James Longstreet took Field’s Division and Gary’s Cavalry Brigade to probe the Union lines on New Market Heights to see if they had been weakened to beef up Warren’s Raid or Butler’s troops earmarked for the first Fort Fisher expedition. Longstreet found the Federal lines north of the James thinly manned by cavalry but declined to attack in the nasty weather and against strong fortifications. His reconnaissance in force retired back to the Confederate lines guarding Richmond.